Tucker Carlson is a vocal supporter of the US President. SKYGAZERS ENJOYED A total eclipse yesterday – a rare event where the sun vanishes behind the moon. The eclipse could be best viewed in the United States. US President Donald Trump was among those to witness the event, taking it in with his family at the White House in Washington DC. Trump looked directly at the eclipse for a period, causing an aide to shout, ‘Don’t look’. He then donned protective glasses, as is recommended by experts to prevent eye damage. Some people were quick to mock Trump after the incident. However, Fox News presenter Tucker Carlson – a vocal supporter of Trump – said it was “perhaps the most impressive thing any president’s ever done”. 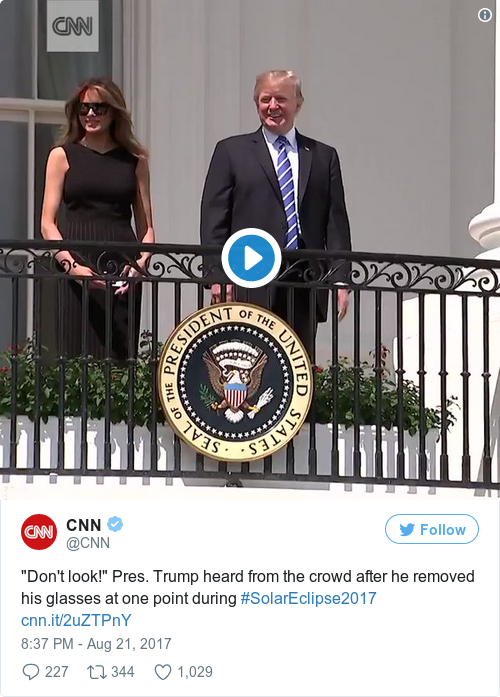 In a tongue-in-cheek moment, Carlson added that the president looking at the sun without protective eyewear was “not a complete surprise”. Read: The United States is about to experience the best eclipse in a lifetime… but how long does Ireland have to wait?